Illustrations note XIII, 533 p.
Understanding the behaviour of unsaturated soils is becoming exclusively essential for geotechnical engineers and designers. 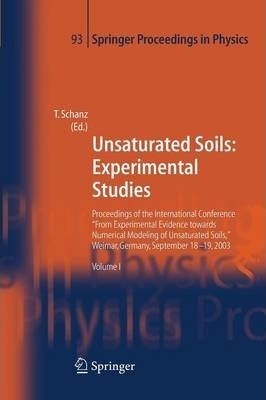 This book includes the Proceedings of the International Conference "From Experimental Evidence Towards Numerical Modeling of Unsaturated Soils" uniting researchers and practitioners in geotechnical engineering on a single platform and discussing the problems associated with unsaturated soils. The objectives of the International Conference were: (a) to promote unsaturated soil mechanics for practical application, (b) to exchange experiences in experimental unsaturated soil mechanics and numerical modelling, (c) to discuss application of unsaturated soil mechanics to a variety of problems. The conference was additionally a status report in the frame of the DFG research group "Mechanics of Unsaturated Soils." The conference was organised under the auspices of the International Society of Soil Mechanics and Geotechnical Engineering (ISSMGE), the National German Geotechnical Society (DGGT) and funded by the German Research Fund (DFG).